My favorite parts of any book or movie are those which describe houses... or food. Which is probably why The Wind in the Willows is one of my favorite children's books, or The Lord of the Rings, or Peter Rabbit, or Anne of Green Gables... so many to choose from which offer literary delights to the senses. I've been known to watch the beginning of The Return of the King just too view the inside of a Hobbit House again (as well as Whose Got Mail for that delightful vintage apartment of Meg Ryan's character). I'm trying to find other books (they don't have to be kid's books) that have excellent descriptions of warm and cozy rooms or equally delicious descriptions of tea time, dinners, picnics... or food in general. Brenda, I have a wonderful book to suggest. You'll probably have to find it on line or maybe the library. "Take Three Tenses: A Fugue in Time" by Rumer Godden. It was published in 1945 and is about a house in London and the family who have lived there for 100 years. 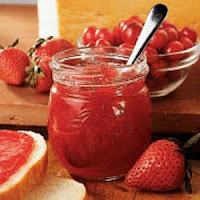 Hi Brenda :) Do re-read Farmer Boy by Laura Ingalls Wilder - the descriptions of the foods and meal prep (and growing the food for that matter) are wonderful! Hi Brenda! I am mostly a lurker, but read your blog daily. :-) And since I love books, had to comment. Miss Read books do a lot of descriptions on homes etc. Really enjoy her writing. I also enjoy books by Rosamunde Pilcher. I am looking forward to reading everyone's suggestions. Grace Livingston Hill. Lots of food, very cozy descriptions. Making a house a home with very little money. How about the description of the meal Mrs. Beaver makes in The Lion, the Witch and the Wardrobe. She fries the fish in butter, drains the potatoes, adds more butter, then serves them hot with mugs of cold milk for the children and beer for Mr. Beaver. And when they're totally full she brings out hot tea and a sticky marmalade roll. It always makes my mouth water. I second the Grace Livingston Hill recommendation. The plotlines are trite, but the homemaking descriptions are delicious. Yes, "Farmer Boy" has wonderful descriptions of the meals. I'm almost finished re-reading it. I read "Winter Cottage" by Carol Ryrie Brink last month and really loved it. It's about a family in the depression who find a cottage and make it their own for the winter. I'll be interested to see what people come up with. I like looking at the homes and gardens in movies too! All of my suggestions have already been offered... Oh I do love the descriptions of the Beavers' home in The Lion, the Witch and the Wardrobe. The Enchanted Barn is my favorite Grace Livingstone Hill for descriptions of homemaking. Love Rosamunde Pilcher's descriptions of food and home, too. I am taking life at a much slower pace..... stopping to smell the roses you might say! I too enjoy houses and reading about them but I can't think of any books to suggest at this moment! 'April Gold' by Grace Livingston Hill. A must-read! 'The Enchanted Barn' is very good, too. I'm waiting for a 'Brambly Hedge' book by Jill Barklem, 'The Hidden Staircase' (used, from an eBay seller). The 'Brambly Hedge' series are children's books that some consider to be better than Beatrix Potter's books (hard to imagine for me, but we'll see). They are supposed to be similar in style to 'The Wind in the Willows', with charming illustrations. I agree with anonymous that Rumer Godden has great descriptions. I love China Court -- great story AND great house! An author very much like Rumer Godden is Elizabeth Goudge. Her houses are always full of meaning and well described. The kitchen in Gentian Hill is the very best part of that book! You are always a better person after reading Goudge. You can find these books at the library. I loved Shell Seeker by Rosamunde Pilcher. It puts you in this delightful little cottage and the description of the food, house and gardens was wonderful. I love to look at pictures of old houses and rooms in magazines. I look at the rooms in the movies instead of watching the movie. I stop and dream about houses described in books. My guilty pleasure is reading murder mysteries (the cozies, not the nasty violent ones) where the bad guy/gal is always caught. Several authors use food and/or houses as the common thread or theme of the books. I always choose these first. I read your blog almost daily and am superfragilisticexpealadociously encouraged by you and your writing. I just had to comment(never, ever, done it before). I agree about State Fair. We just watched it last night and I loved the bedroom, kitchen, and the trailer they took to the fair. Also, in Seven Brides for Seven Brothers, I love the way Milly comes in and makes beauty out of chaos. As far as reading goes, you might give the book Mandy by Julie Andrews (yes, Sound of Music fame)a try. Mandy is a orphan who "adopts" an abandoned house she discovers behind the orphanage. Please keep up the wonderful encouraging work. I second Rosamunde Pilcher. Also Gladys Taber and, of course, Tasha Tudor. Jan Karon's Mitford series is another one for good descriptions of both food and place. The Elm Creek Quilts series by Jennifer Chiaverini (I think I spelled that right) is great for food descriptions. The Blossom Street books by Debbie Macomber. I'm a big fan of domestic fiction too! Thought of another one...The Penderwicks by Jane Birdsall. This is a children's book, but wonderfully written. Oh and one more...The Gone Away Lake and Melendy books by Elizabeth Enright. I'm also fond of the dollhouse described in Big Susan. Finally, not your typical domestic scene, but the descriptions of the house in a tree from The Other Side of the Mountain are, I think, charming. Do you know the books by Della Thompson Lutes which were popular in the late 30s and early 40s? Country Kitchen is still in print. I also love Home Grown, Cousin William, Millbrook. Great descriptions of country life near Jackson, Michigan in the late 1800s. Susan Wittig Alberts books based on Beatrix Potter, which you can get in libraries now, are also charming once you get past the talking animals bit! I think the "Redwall" series of books by Brian Jacques would be ones that you would enjoy! yes me too!!! I second on Della Lutes (Cousin William is precious!) 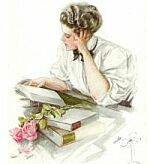 and Grace Livingston Hill books will actually insprire me to get up and do some homemaking! Think I'll make a list of these good food and home story books. I've been reading quietly for awhile now, and "visiting" you is such a blessing to me. 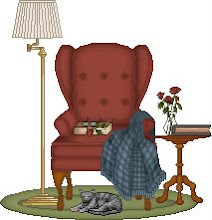 My favorite bit of domestic fiction is "Home for the Day" by Rosamunde Pilcher (it's a short story in The Blue Bedroom). I haven't been able to think of a movie example that rivals Meg Ryan's apartment in "Mail" (that would be hard! :)), but I do seem to remember that the 1994 version of "Little Women" (with Winona Ryder) had a lovely backdrop of domesticity all through the movie. And, the March family was certainly keeping home on a budget! There's another homekeeping book that I really enjoy, but it's not fiction -- "Creating a SenseSational Home" by Terry Willits. Her approach is Christ-centered, but focuses on lots of "practical" things... like scented candles, fresh linens, whistling teapots, etc. Her descriptions sound like a place I'd like to live! btw..I love driving at night, or should I say when my husband drives at night and someone has their drapes or curtains open and you get a glimpse into their home..do you do that? I love the house in the video 'The Christmas Box' is fabulous and the message of the movie is excellent too - I just love it when the children ask for it again and again - I drool over the wood paneling and the cozy old attic stuffed with treasures! I've been reading your blog for a while but have never commented before. I wanted to also agree that the Grace Livingston Hill books have wonderful descriptions of home. I especially like The Honor Girl. I read it when I feel like the house is in chaos and am always insprired to create loveliness out of the mess like she does in the book. I have always loved that quaint apartment on "You've Got Mail" as well. Many of the other books described also contain some of my favorite "home" scenes, but I love the first book in the Boxcar Children series where the children make such a lovely home in their abandoned railway car and creatively live life with so little. Hello again! I am so enjoying reading everyone's suggestions. Can't wait to go to the library! I very much agree with Katie, that "Home for the Day" is my favorite story of Rosamunde Pilcher. It is one I read over and over again. I will go back to lurking now. :-) Thanks, Brenda, for a great book discussion! 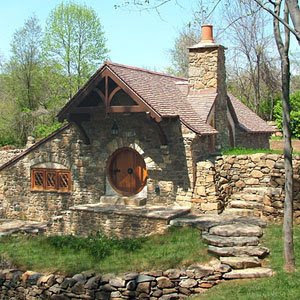 I need a hobbit house for a get away- it is beautiful. I love to look at books about unusual houses. Two of my favorite books along this line are Papa's Wife and The Home Has a Heart, both by Thyra Ferre Bjorn. The best mother in the world here. It pierces my heart. Thanks for starting the discussion. This is one of my favourite post topics - I recommend The Country Child by Alison Uttley. It is brimming with homey descriptions and marvellous nature scenes. A Bear Called Paddington....the scene on Paddington Station with the bun and the tea had me drooling!! And of course all of the Paddington stories make some mention of cake or toast and marmalade sandwiches!! And Elevenses!!! Someone had mentioned mysteries, and I once read a book called "Dying for Chocolate" that actually had the recipes printed out on pages within the book....I even copied some of them out!! Mouth-watering food descriptions...I just can't remember if there was any inappropriate content or not. First We Have Coffee and Then We Talk...can you remember the author's name? you gave me the book, it's on my shelf downstairs...not fiction, of course, but still reads more like fiction than not. Babette's Feast...can't believe that wasn't on there!!! :) and I love the "homie-ness" of the new Pride and Prejudice, with the girls bouncing around and laughing and everything looks a little worn and old. The new "Sense and Sensibility" has the loveliest little seaside cottage in it, too. Dear Sally Clarkson lead me to your wonderful blog! I am loving it already! One book I love is "Five Little Peppers and How They Grew" by Margaret Sidney...the beautiful scenes in their little brown house are very dear. The kiddos didn't want me to read the last chapter because they didn't want it to end. And I just found out the author wrote sequels which is very exciting! It is so neat to see that others share my love of "movie homes"...I thought I was the only one! I also love Meg Ryan's home in Sleepless in Seattle....very homey. Also North and South (BBC) I love how the homes seem almost like little lights in that city of industry. Before you go to compiling, Brenda, I've been meaning to add a suggestion. D.E. Stevenson books. Perhaps your library has gotten rid of them, like mine has, and more's the pity. D.E. is a descendent of Robert Lewis and writes WW II era. And they are treasures when you find them on your thrifting forays. One idea in particular that I found curious. I don't remember which book, but the main character was renting a "flat" in which every item was furnished. It became a cause for concern when a drinking glass (I think it was) was broken. In our time of "stuff" this continues to amaze me. I wish I knew who "anonymous" is who mentioned D.E. Stevenson, my favorite author. In fact a list discussing her work began on yahoo groups eleven years ago and is still going strong. We met for a tenth anniversary "gathering" in Boston where Boston University houses a great collection of material by and about her (correspondence, old photographs, and much else). Next summer we are meeting in Edinburgh, and also traveling to Moffat, her home of many years. R.L. Stevenson was her father's first cousin and Lord Robert of Kandahar was a cousin of her mothers.Other books which have a special place in my heart are Mrs. Appleyard and I by Louise Andrews Kent, and some of Georgette Heyer's - A Civil Contract and Frederica are probably my favorites. And for those who like Who's Got Mail, the original of this The Shop Around the Corner from the 40s is wonderful. I've lived in Budapest and find it very authentic for the time period. Also In the Good Old Summertime is another remake of this very popular story. for the spaniel, in which they are supposed to lie, preferring the hearthrug, where they can be near the feet of their gods and the warmth of their gods' fire. It is a peaceful room, a friendly room." I have always loved Grace Livingston Hill's books and Emily Loring's books for those reasons. I read them when I was a teen. I think I am going to revisit them. I love warm and cozy books. I am reading "All of a Kind Family" now.